Brush Set for TSC 2 Slat Cleaner. ..
Set of Two (2) Cleaning Tools #2 (0.08-0.114 in) for TSC 100 Slat Cleaner. ..
Set of Two (2) Cleaning Tools #3 (0.144-0.155 in) for TSC 100 Slat Cleaner. 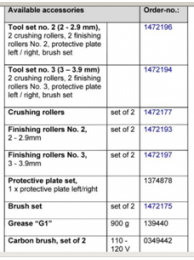 ..
Set of Two (2) Crushing Rollers (roughing) for TSC 2 Slat Cleaner. .. Distance Plate for TSC 100 Slat Cleaner. If the height difference between the cross slat and sl..
Set of Two (2) Finishing Rollers #2 (0.08-0.11 in) for TSC 2 Slat Cleaner. .. Grease (G1) 31.75 oz for TSC 2 Slat Cleaner. .. One-Man Handle for TSC 2 Slat Cleaner. .. 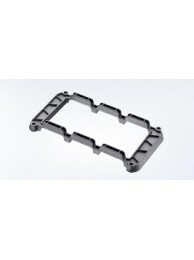 Protective Plate Set (Left/Right) for TSC 2 Slat Cleaner. ..
Standard Tool Set #2 (0.08-0.11 in) for TSC 2 Slat Cleaner. Includes Two (2) Crushin..
Standard Tool Set #3 (0.12-0.15 in) for TSC 2 Slat Cleaner. Includes Two (2) Crushin..